I'm not a VIP, but every once in a while I get to pretend. Like last night. V and I had the pleasure of attending the Forum 2000 Gala Dinner at the restaurant Mlýnec. We'd been to this restaurant several times before. I'd always found dinner there enjoyable. The food was always good, though not quite as spectacular as the prices. 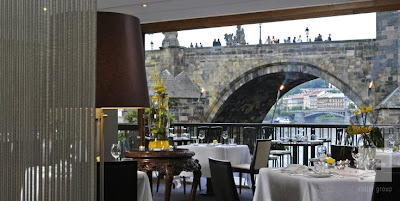 Perhaps the most impressive thing about the restaurant is its close up view of the Charles Bridge. Last night's meal was a fixed menu for the 100 or so dignitaries. Unfortunately, given the dictates of decorum, I didn't take any food photos. There was an amuse bouche of a small mushroom tart (nice), a quail and mushroom risotto starter (very nice), a main course of salmon wrapped around a white fish with teriyaki sauce (not so nice, not a salmon fan), and a warm apple and cinnamon tart with walnut ice cream for dessert (V's favorite part). There were quite a few actual VIPs at the dinner, including Czech Prime Minister Jan Fischer, who made a speech, and many friends of Vaclav Havel, who started Forum 2000 when he was Czech president. I figured I could get away with taking one picture during the evening -- so forgive me that it is not of my quail or salmon. 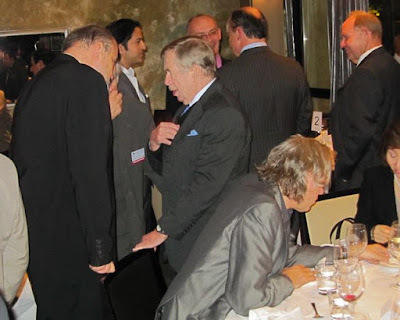 Here's a shot of Vaclav Havel and Sir Bob Geldoff, who sat quite close to us, immersed in postprandial conversation.